On Wednesday morning she showed up to talk all about her new movie The Perks Of Being A Wallflower at Radio 1 dressed in geek chic with her spectacles and coat. But fast forward a few hours and Emma Watson decided to dress to the nines as she took to the red carpet to promote the film on Wednesday night. But the Harry Potter actress appeared to have forgotten to take her trousers off as she showed up looking stunning in black... but wearing both a dress and long pants to the glitzy event. It could be that she was simply trying to make a style statement but it rather made her look confused as she matched her black trousers to her strapless frock. From her knees upward, Emma looked stunning and like she was playing it safe in the Dior ensemble with the sweetheart neckline. Her cropped hair seems to have grown out slightly, which she wore wavy and pinned to the sides. Smiling sweetly the 22-year-old accessorised with an intricate silver pendant in the shape of a key and kept her make-up low-key. But as eyes moved downwards it became evident Emma had not only worn a dress to the screening but also a pair of trousers worn underneath it or even especially stitched to the gown. Although she still looked glamorous and grown up with her skyhigh heels finishing off the look. And fans of the star will see her more grown up when her new film hits cinema screens. As Hermione Granger in the Harry Potter movies, Watson wasn't required to do many kissing scenes. So when it came to puckering up with her co-star in her latest movie The Perks Of Being A Wallflower, Emma admitted she found the scene more than a little difficult. 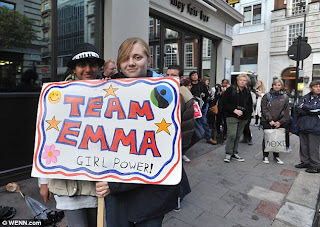 Emma revealed during an interview with Nick Grimshaw on his new Radio 1 breakfast show on the morning of the premiere that she just can't watch when the passionate scene comes on during the movie.